How Long Will It Take? | Mediterra - Swim & Run Better Than Ever! How long will it take to integrate this skill so that I can do it without thinking so much? That is a version of the question I hear from time to time. It is a good question with a very complicated answer, if I were to attempt to personalized it for each person who asked. The complexity of the skill being changed. The strength of the fundamental skills that must be in place to support this skill project (the difference between basic fundamental skills and higher dependent skills). The level of automation you are aiming for (your ability to turn on the ‘auto-pilot’ for this skill and focus on other things). The quality of your attention (to hold focus and give precise commands to points of your body). The level of your proprioception (your ability to accurately sense position and movement through the nervous system). Your experience in going through the physical skill improvement process (the more you’ve done it the easier it becomes – dancers have an advantage!). How well you design the practice set (to work with the way the brain learns complex skills). The quality of the feedback loop (relevant, direct, immediate). Duration and intensity of practice set (not too little nor too much). Frequency of practice (frequently enough, while providing necessary rest in between). All those details would overwhelm most swimmers, no doubt, and hence the reason they go to coaches for help. Physical therapists would know this, but not many coaches. This is what neurologically-oriented coaches consider when planning practices for individual students. However, you can help yourself do more effective neural training by understanding how this works and setting up your own expectations and practice accordingly. With that goal in mind I will attempt to give you some sort of concrete answer to the question, while acknowledging the extreme complexity of it. That complexity makes it impossible for me to give a precise estimate for any person who might read this – since the swimmer’s individual situation determines those details – but I can give you something solid to work with in a very general way. 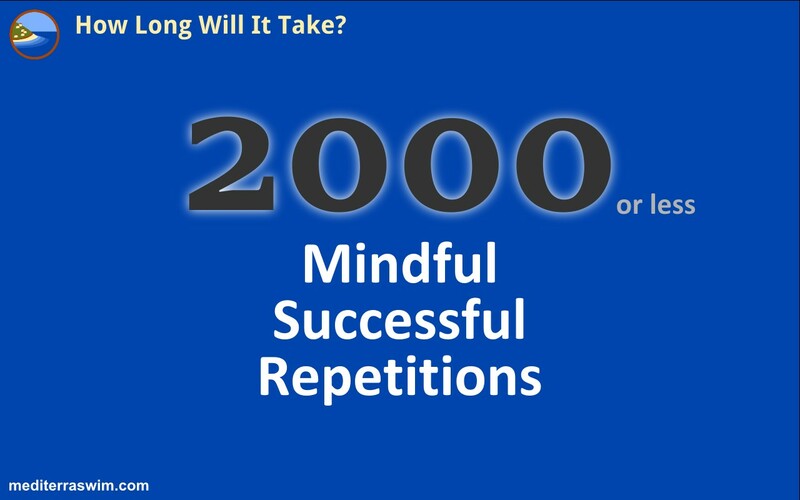 You may experience some level of automation of the skill somewhere within 2000 mindful, successful repetitions of that particular position or movement pattern. From studying the viewpoint and experience of neuro physical and occupational therapists we can get the idea that it takes a lot of time and dedication to hard wire a new skill. There is no clear or magic number, but thousands of repetitions rather than hundreds is what these professionals expect. Some people may require more and some less. I work with this ‘2000 repetition’ number. It has been reinforced by my observations of hundreds of swimmers, and by my own experience in making changes in my movement patterns. Note carefully how I phrased that answer… ‘some level of automation‘ and ‘somewhere within 2000‘ and ‘mindful, successful repetitions‘. Some level of automation – when you want to know how long it will take, you must clearly define in terms of external product and internal sensation what ‘it’ is. The more vague your desired result the more vague the time estimate will be. I am proposing that you can get some tangible level of automation of most common smooth swimming skills after 2000 repetitions – automated enough to hold up under low-intensity swimming, with ‘automation’ meaning the ‘hard-wires’ in the brain get firmly connected and you can remember how to do it immediately in the next practice. But if it is an advanced skill (like breathing or 2 Beat Kick) this requires the supporting fundamental skills to be in place to support it. Sorry, no shortcuts. You can’t play the blues until your fingers learn some basic blues scales, and at first you play slowly. And you can’t expect to play the blues for 2 hours straight without doing the intense training to maintain precision for that duration. Somewhere within 2000 repetitions – maybe it will take you 200, maybe all 2000. But by 2000 you should notice some new patterns sticking firmly in your muscle memory. Mindful repetitions – these will require conscious, intentional commands given to muscles in order to retrain their action. Mindless, non-attentive repetitions don’t count toward the total number. Successful repetitions – this assumes that you can execute at least one movement as intended. Now you need to do it 2000 times the same way. Those unsuccessful movements don’t count toward the total number. Why bother giving a number at all, if it is so conditional? First of all – some of you have asked! Second, for those who are new at the stroke-transformation process I want you to have some solid number to start planning your expectations with. You can refine it with more experience, and become intuitive later on. Does 2000 seem like a lot? Too little? Let’s assume one may move forward roughly 1 meter per stroke. – in a 4000 meter swim (for math simplicity let’s forget the turns and push-off which would subtract some of that distance) will require about 4000 strokes – 2000 on the right and 2000 on the left. If one were to aim for a very specific correction to one of his arms, and he were able to execute that change successfully for most of those strokes he might imprint that change into his muscle memory in just one long swim. But it is not common for someone to spend 4000 meters concentrating on one single stroke correction – that indeed would be extraordinary. Let’s say our swimmer has 3 skill projects to he wants to work on. He is going to assign 500 meters to each project in a practice. Since head position is held steady at every moment, in every stroke (except breathing), that may take 4 practices (4x 500 = 2000) to integrate. Since catch on the left arm will be executed about 250 times in 500 meters that may take 8 practices (8x 250 = 2000) to integrate. Since breathing on the weak side may happen every 3 strokes (granted he is disciplining himself to breath both side evenly on a 3-stroke pattern) then he gets about 175 repetitions in 500 meters. It may take about 12 practices to integrate this change. Of course, all those calculations assumed this swimmer was going to execute the change successfully 100% of the strokes. That’s unrealistic. We would still regard it as quite good if he were still executing it well 80-90% of the stroke. While we would regard the skill as still quite weak if he was executing it well 50% or less. The more consistent your precision is, the stronger your skill is and vice versa. So, the 2000 successful strokes is a number to use as a planning and measurement tool – that’s all. There are a hundred ‘what-if?’ comments we could make about this heuristic approach to estimating imprint time. But it gives you some logic based on experience to start estimating your improvement schedule by. thanks for this great blog even with, although with some variability, some numbers. – One thing I Interpret as positive when happens. When focusing in new and it wan’t work as assumed, and I realize one point is ( or seems to be) control over my last (former new) skill becomes sloppy, which should be unconsciously. This at least shows me some (first?) changes had happened. – There’s always something in TI-drills I’d call “temptation of well-being”. Maybe that made me addicted to TI. For example: When focusing in spearing to catch I do like the feeling of waterflow all around especially at my armpits. When working on breathing strokes I’ve to give up this a little and have to find a compromise between both (because breahting from time to time is a good feeling also), which sometimes leads me to overestimate the well-Feeling of the first. So in this context the question will be: How much of my well feelings from my old skills I’ve to abandon to integrate new skills… And will there be a new step of well feeling which integrates new with the old? (Think I know your answer, but for matter of interest…) And is the new one a skill only if it produces an intergated felt good whole stroke? I make the case that there is a strong correlation between things feeling good in the stroke and better performance. But it takes a package of good skills (and their corresponding good feeling) to come together at the same time, in order to produce better performance. The farther you get along in swimming skill, the more you’ll get your improvement from accumulation of small advantages, rather than single skill improvements. Let’s say you get (out of a scale of 1 to 10) a 8-point sense of ‘well-being’ (which I might label as ‘easy and smooth’) when you focus on that skill like ‘sneaky breath’. But the moment you focus on something else. like the kick. and while you can create a 7-point sense of well-being in the kick, that feeling of the sneaky breath drops to 5. That is expected when working on these advanced skills. You have to recognize some minimum level of genuine skill – it might not feel ‘perfect’ (= the best that you can produce) but it is still functional and doing what it is suppose to do (= you are still getting a decent breath and not slowing down), though not as good as you know it could be. The sensation for each skill (and its performance) will improve there through more mindful repetitions – yet there is not distinct line, it is a fuzzy one. One day you just notice that things things are working together at the same time and they both feel so much better than they did a few weeks ago. I might suggest that the first level of automation means the skill will stay there while you focus on other things, even though it might not feel so close to your best (if you were to focus on it fully). The next level of automation (another 2000 repetitions?) means it stays very close to your best even when you are focused on something else. The third level of automation means all parts remain as you intend them to be, and there is no change in your stroke whether you focus on anything or not – the effects of your focus at this stage, the improvements you make are deeply internal and cannot be seen easily from the outside, but show up in subtle improvements in performance.